At High Point University, part of the inspiring environment takes place outside of the classroom. In a typical year two-thirds of the entering freshman come from states other than North Carolina; one-third, from more than 500 miles away. As a result, students tend to stay on campus over the weekends. 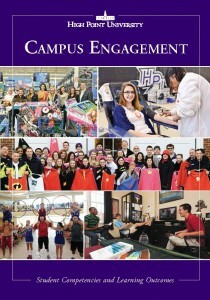 In fact, even students who could easily go home often don’t because their friends at High Point don’t and because there is much to do on campus and off. The Office of Student Activities works to plan a calendar jam-packed with fun and exciting opportunities. Every week we offer a variety events from Monday movies in the Extraordinaire Cinema, Wednesday Night Live events such as coffee houses or karaoke, and venture trips off campus to different places in the surrounding community. All activities are complimentary to our students! Students can find out about upcoming events through Facebook and Twitter and the Campus Concierge Daily Email. Campus Activities Team (CAT) is a student run organization that works to plan all the great activities on campus each semester. Facility Assistants are student employees who work in the Extraordinaire Cinema and the Point Arcade, both located in the R.G. Wanek Center. Interested in getting involved? Find out more here!